Real Inspirational Stories for Challenging Times. Practical Insights to Motivate, Inspire and Make You Think Positively. Learn to break through what’s stopping you from reaching your goals. An entertaining mix of stories to captivate you all the way through. Practical Insights to Make You Think Positively. An entertaining mix stories to captivate you all the way through. Written in the words of a fun and savvy best friend, Regroup is the entertaining and uplifting read that we all need in these days of uncertainty. Serial entrepreneur and lifestyle architect Jaunique Sealey gives the inspiring stories to motivate, plus the encouragement and tools needed to move past the pain and confidence-attacking side-effects of setbacks. In the process, she courageously shares her own failure stories that threatened to derail the creation of her own dreams. Taking other examples from cultural icons such as Prince, Beyoncé, and billionaires Sara Blakely and Nick Woodman, the author seamlessly sews together a rich tapestry of scientific proof and no-holds-barred real life experiences to generate a beautiful accessible life lesson that you’ll want to immediately put to use. Whether you are looking for advice on a jumpstart or a restart, Regroup: the How-To of Never Giving up brings a practical and story-centered treatment to the motivational advice that we hear so commonly. If you want to learn how “not to give up,” how to create and keep your motivation, and how to make it through uncertain times through the honest, candid and emotionally open experiences of others, this is the book for you. You won’t be sorry you turned these pages of delightful and insightful prose. Whether you are a parent, entrepreneur, student or employee in pursuit of success, at some point, you have received the well-meaning advice, to “never give up.” If your next thought was, what does that even mean? This book is for you. In Regroup: the How-To of Never Giving Up, Harvard-trained serial entrepreneur, progressive thought-leader and innovative resilience expert Jaunique Sealey brings her unconventional perspective and fresh approach to a familiar topic, authoring a tool that has never been available before. Regroup is not only a process, but a literal recipe for resilience, a “how-to” for navigating setbacks, overcoming obstacles, and enduring disappointment in order to truly, reliably and predictably never give up on the way to your own goals. This is the roadmap to personal accomplishment that you have been looking for. 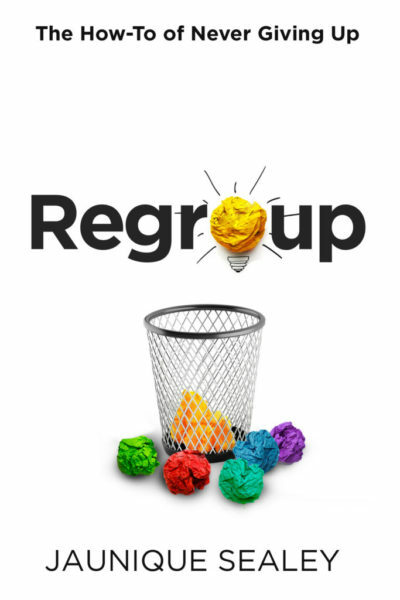 Regroup offers a new theory of success – crafting a life on your own terms, with fulfilling endeavors, missions accomplished and goals achieved. A quick and enjoyable read, Regroup is filled with actionable wisdom and the author’s unique approach to finding the baseline commonality between you and even the most enviable of success stories in order to expose the relevant insights to directly help you bridge the gap. With the lessons in Regroup you’ll learn how to build resilience and be equipped with the tools to motivate your teenager, your peers, and the people around you with an accessible framework for goal setting and goal reaching success.